A bit of sun, the waves of the ocean that looks like the sea. The goodness of a thick and refreshing soup. An open afternoon and a book to start. So I build my own summer in the city. Salmorejo is a cold soup, thick and creamy, traditional of the city of Cordoba, Spain. It's usually garnished with hard-boiled eggs, cut into cubes, and slices of jamon Serrano. Mine is the very very good veg version. Prepare the cucumber salsa (salsa as in Mexican salsa, it's not a sauce but a salsa, yes? ): peel the cucumber and cut it into cubes along with the tomato. Mix them with a little chopped onion and season with lime juice, salt, pepper, and minced fresh cilantro. Cover with plastic wrap and keep in the fridge. For the soup, cut bread into cubes and pour over 4 tablespoons of water. Keep aside. 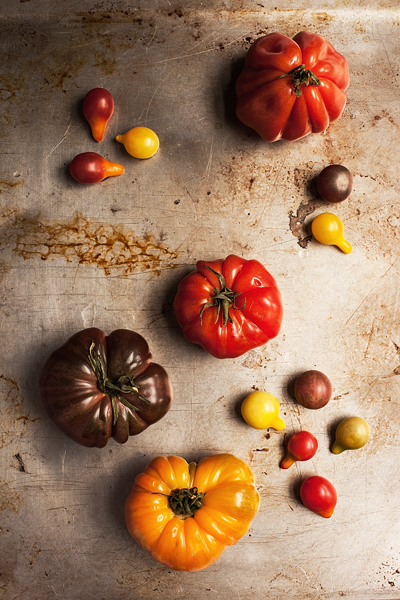 Peel the tomatoes by dipping them in boiling water for a few seconds, and cut in pieces. Blend them with their liquid along with soaked bread (do not squeeze out the water), garlic, toasted almonds, olive oil and vinegar. Season with salt and pepper and add more water if necessary. Keep salmorejo in the refrigerator for at least two hours. 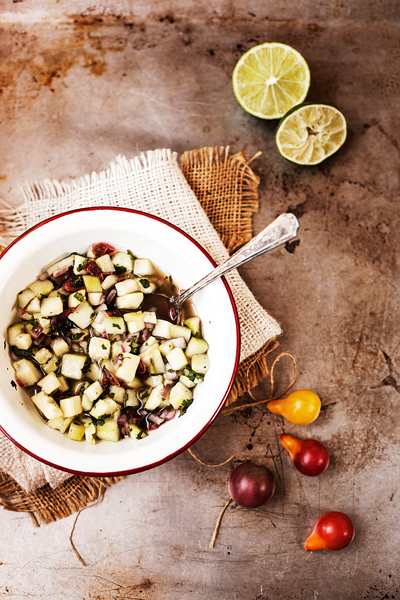 Serve chilled and garnish each bowl with a spoonful of cucumber salsa.